Many of you have heard about the Canine Influenza Virus (CIV) outbreak happening NOW in the Bay Area. Over 50 dogs have tested positive for the H3N2 strain of CIV with over 200 more suspected cases. Sadly there has been one reported death. ALL of the affected dogs had recently boarded or spent time at a daycare facility. In the last 45 days, 72 cases of H3N2 have been positively identified in California. Over 2500 cases have been diagnosed nationwide to date. As of October 2017 CIV has been diagnosed in 46 states. Here’s what you need to know about Canine Influenza Virus. CIV was first identified as a factor in canine respiratory disease in 2004. This virus is a genetic variant of the H3N8 equine influenza virus that gained the ability to infect dogs. The key change in the virus was the ability for transmission of the virus from dog to dog. The Asian H3N2 virus is derived from an avian strain that also gained the ability to infect dogs and be transmitted from dog to dog. H3N2 was first identified in 2015. Both strains have been seen in California and the new strain as close to San Diego as Orange County. CIV is transmitted by close contact with an infected dog, often in a restricted space such as an animal shelter, day care center, or boarding kennel. Virtually all dogs are susceptible regardless of age or breed (about 80% of dogs exposed WILL become sick). Influenza virus infection in dogs follows a similar pattern to infections in other species. The onset of clinical signs will be 2-3 days post infection. Peak of virus shed is 3-4 days post infection HOWEVER dogs will also shed the virus BEFORE the onset of clinical signs. Longer shedding times of up to 24 days have been identified in dogs infected with H3N2 and for this reason ANY dog with an upper respiratory infection should be kept home for AT LEAST 21 days. Dogs may continue to cough for several weeks following recovery from acute infection. While in the past CIV infections in and of themselves have not shown a significant mortality rate, CIV infections as well as other respiratory viruses compromise the normal defenses of the lung permitting secondary bacterial pneumonias to occur that can result in death. Vaccination has proven to be quite effective in controlling the spread of CIV. In some dogs complete prevention of the disease occurs, but mostly we see a DRAMATIC decrease in the disease severity in vaccinated dogs to mild and easily manageable symptoms. Most importantly for daycares and boarding and grooming facilities though is that the vaccine SIGNIFICANTLY decreases the shedding of the virus and subsequently the massive spread of the disease. The American Animal Hospital Association Canine Vaccination Task Force strongly recommends that EVERY dog who visits a boarding, daycare or grooming facility GET VACCINATED! Once an outbreak occurs it may be too late to prevent your dog from contracting the disease. 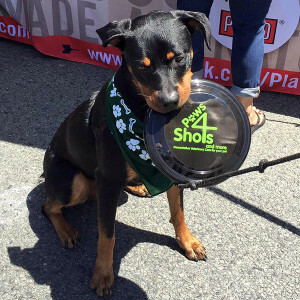 Paws 4 Shots offers vaccination against BOTH strains of the CIV virus. Two doses are administered 2-4 weeks apart and then ONCE annually thereafter. If your dog has received the H3N8 vaccination, please make sure to add in the H3N2 vaccine. If your dog does become sick with symptoms of an upper respiratory infection (URI) your veterinarian can perform an upper respiratory panel to test for Bordetella, Parainfluenza, Adenovirus Type 2, Mycoplasma and H3N8. There is also a specific test for H3N2 that is NOT currently part of this existing panel and therefore needs to be submitted in addition to the upper respiratory panel. Please make sure that your veterinarian KNOWS ahead of time that your dog is exhibiting URI symptoms as they will take specific precautions to isolate your dog preventing infection of other patients at their clinic. It would obviously be prudent to keep any dog with even the mildest of coughs home from daycare/boarding or grooming, to do your best to avoid infecting others! Typically, it is recommended that dogs diagnosed with “kennel cough” (now known as “canine cough” remain isolated for 10 days but remember, if CIV is suspected or diagnosed, that period is increased to 21 days MINIMUM.